What if tearing down I-787 could actually improve traffic? 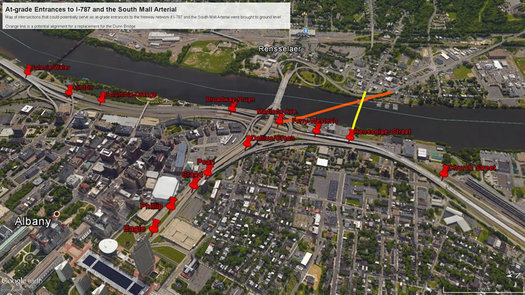 The future of I-787 often pops up in conversations about downtown Albany - specifically, the desire that many people apparently have to see the elevated highway torn down. There's a currently a longterm effort by a group of state and local agencies to study this overall topic. And you're probably already familiar with some of the potential benefits the tear-it-down crowd touts: A boulevard replacement would reconnect the city with the waterfront. It could improve air quality, especially in some underprivileged areas. And it could open up considerable portions of land for development. Of course, one of the counter arguments is that 787 is necessary to handle the large amounts of traffic that flow into Albany each weekday, and tearing it down would tip downtown into traffic gridlock. But what if it was just the opposite -- what if tearing down 787 could actually make traffic in Albany flow more smoothly and efficiently? To be clear, as someone who moved here from larger cities, I am legally restricted from complaining about traffic congestion in the Capital Region. But that doesn't mean that it's not an occasional pain -- or that eliminating as many problems as possible isn't a good idea. Since concerns about traffic are often an excuse for not tearing down an urban freeway, perhaps I can even disprove some myths. Here's the case. Since access to the freeway network is so limited, traffic jams often back up at the few entrances while other roadways sit empty. For example, as workers for the state and Albany Medical Center leave between 4 and 5 pm, Swan Street (the street the runs along the west side wall of the ESP) often backs up from the SMA entrance at Hudson Ave all the way to (and often through) the intersection with Madison Ave two blocks away. Why? Because other options for accessing the freeway network in most directions are very limited. The Google Maps proposed alternative for northbound travel, for example, requires traveling all the way down Madison, a loop under 787, and then travel along the waterfront for several blocks before a driver can actually access the freeway. Even a boulevard replacement for 787 and the South Mall Arterial wouldn't incorporate an intersection at all of these points -- but surely there would be more access than there is today. And that could be a major benefit for the entire network. We see that same dynamic at effect in Albany. 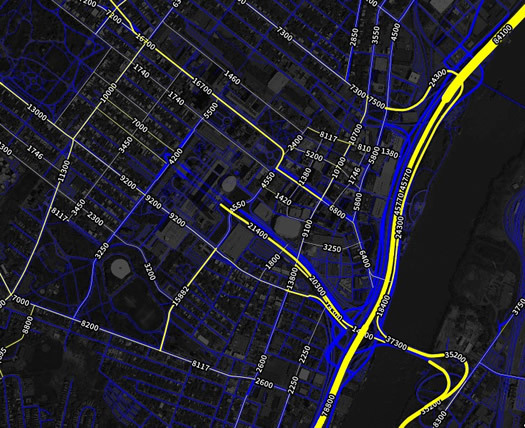 Drawing on Eric Fischer's stunning visualization of traffic count data for Mapbox, you'll notice that 787 and the SMA carry (by Albany standards) large volumes of traffic, while the surface arterials see relatively little. The road most closely parallel to 787, Broadway, carries only 6,400 cars per day at its busiest point--far below what should be expected from a two-to-four-lane urban arterial. South Pearl Street carries only 2,600 cars per day, a stunningly low total. This suggests that even if a surface boulevard that replaces 787 and the SMA has significantly lower capacity than the freeway -- and if you've ever seen Lake Shore Drive in Chicago or the West Side Highway in New York City, you know a boulevard can carry levels of traffic well higher than those 787 sees -- the street grid would be able to absorb the spillover traffic with limited resulting congestion. Redistributing -- really, re-balancing -- traffic from 787 to the surface network could even provide significant economic benefit to Albany merchants; drivers who hop on the freeway are drivers who never see or try the wide variety of shops, restaurants, and the like potentially available on the streets of Albany. Having spent a good chunk of last summer researching freeway teardown projects, I can say with confidence that the main conclusion of researchers has been that the existing data set is not big enough to create an iron law of freeway teardowns. Each situation is unique; often, it's hard or impossible to predict the exact effects of a teardown in advance. 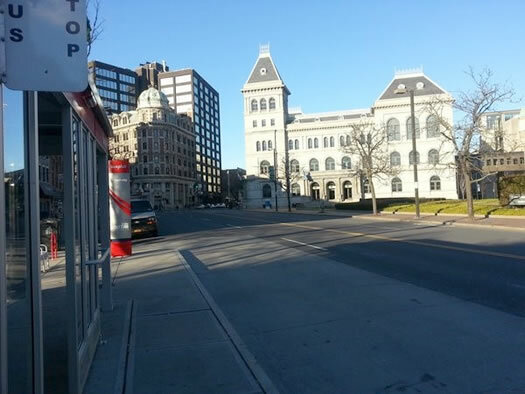 However, there also seems to be enough evidence for me to think that tearing down the urban portions of 787 and the South Mall Arterial and replacing them with something more modest and friendlier to an urban environment should not cause many congestion problems -- and may actually help Albany's traffic. Sandy Johnston is finishing up his Master's in Regional Planning and a certificate in Urban Policy at UAlbany. He blogs at www.itineranturbanist.wordpress.com and is a vocal presence on Twitter @sandypsj. Before moving to Albany, Sandy had lived in New Jersey, Oregon, Iowa, Connecticut, Chicago, Jerusalem, and New York City. Sandy lives in Center Square/Hudson Park with his partner Gabriella, a state worker, and their two cats. You can reach Sandy with comments or complaints through his website. I'm sold. Tear it down. San Francisco tore down its Embarcadero Freeway after the Loma Prieta earthquake, as well as much of the elevated highway that fed it while chopping up the city. The city is vastly improved by the access to the waterfront. Parks were created after removal of other parts of the elevated freeways, damaged by the earthquake. Check the photos online. The change astounds. Everybody in SF can still get to work. 787 is a mess. Get rid of it. Where's the money going to come from for such a project? Without strong funding in place from multiple agencies, this project is nothing but a pipe dream. DOT, EPA, ESD, OGS would all have to be on the same page. The feasibility study alone would be massive. This is jibberish. Agree, ...Golub..., if something might be difficult or isn't a complete guarantee, we shouldn't even think about it. Snark aside, I think 787 can be improved and managed, even though I'm always solidly on whatever side of the argument drivers are not. It's a terrible road that replaced an equally ugly rail yard, but I think the very worst aspects are the South Mall Arterial and the Dunn Memorial Bridge. Take that stupid circle loop, simplify 787, simplify the Dunn bridge with a flyover or whatever you need and make a simple access road into ESP from a new boulevard where the highway used to be. You'd also free up some wonderful land by the river in Rensselaer. This was all part of a system that fortunately was not finished (and would have destroyed both cities far beyond any hope of repair). As a result, this little stub, on both sides of the interstate, seems to carry virtually no traffic at all, even at peak hours. All that said, I'm fully behind taking all the highways out of all the cities, so if the plan is to take the whole thing down, I'd be there with fresh Cokes and watermelon for the demo people. No need for money to tear it down, just let crumble like the rest of the infrastructure in Albany. I understand our water pipes are almost 150 years old. I love the idea of a teardown. 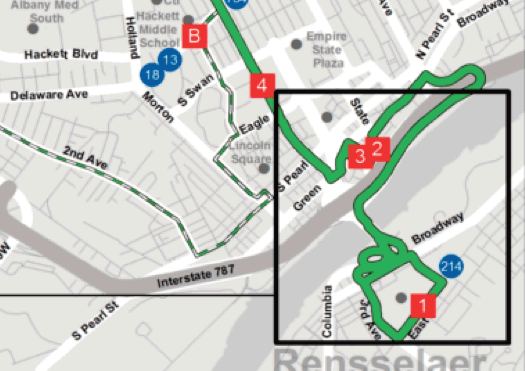 I also want to emphasize what could be a really pleasant walk from Albany to Renssalaer by re-establishing old bridge walkways (e.g. the old railway bridge pedestrian walkway). This could also spark a lively new development in Renssalaer, which is long overdue. Moving new development close to the river and increasing access to riverfront parks and businesses could mean a pleasant renaissance for our fair city and for our neighbors across the river. 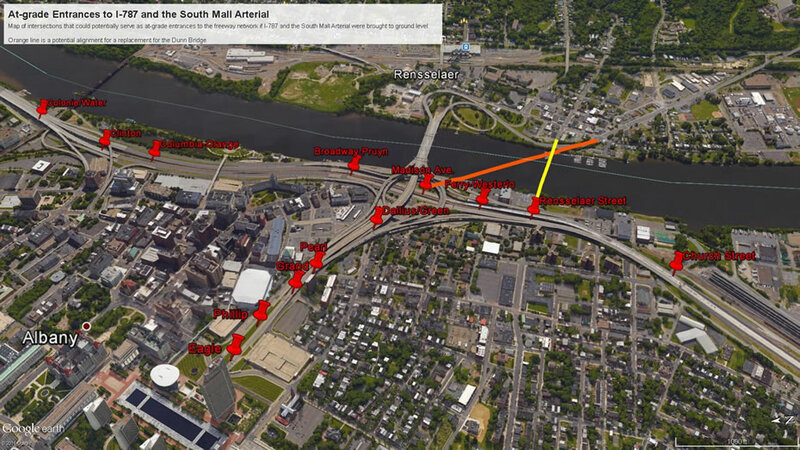 I'd love to walk from downtown Albany over the river for dinner and/or shopping in Renssaelaer. What a great evening's entertainment that would be, eh? JayK, while I don't entirely disagree with your statement, I am not fully understanding where it's coming from. Per your words "even though I'm always solidly on whatever side of the argument drivers are not.."-if that is the case-why are you weighing in on a highway issue that purely affects drivers? Also, what is your beef with drivers in the city of Albany? It's not like we're living in a pedestrian friendly city and the majority of the population commutes to the city (reason for that you would have to ask the Rockefeller family) so to advocate, again in your words, "taking all of the highways out of all the cities," is completely preposterous. @JayK right on. The arterial is the real problem and could be addressed in a more limited (read feasible) way than the entire urban portion of 787. More studies, nothing is ever done. That is what I told those studying this last year. JayK above is saying exactly what I have said every time this comes up. Tear down the South Mall Arterial and the bridge with that awful set of ribbons called an intersection - all shown in your picture above. A new river level bridge (like Green Island bridge) at the Broadway underpass, and perhaps a flyover bridge further south to connect with route 20. Walk or bike from Albany to the train station. Open up acres of land. Knit back the north and south sides of the city. Doing this would be 75 or 80% of tearing down all of 787. JUST DO IT. DO SOMETHING. STOP TALKING ABOUT IT! A few points. 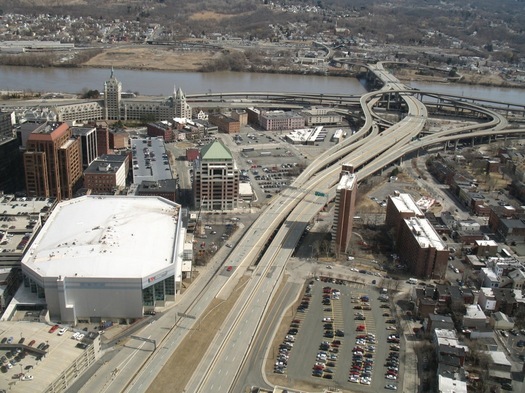 First, a flaw in the article: while the stub freeway that goes under the plaza could be considered "a disconnected stub" (as well as the Dunn Bridge), 787 itself is not such a roadway, as it IS connected to the Thruway, 90, and Route 7. Second, while the arterials described in the article are more or less interconnected to the north of downtown, they're much less so to the south. I also happen to think that those arterials would be better utilized for bus lines, bike routes, and traffic calming than for redistributing 787 traffic. Third, one needs to look at historical context (which I think the author failed to consider). Consider that, back when 787 was built, the riverland was largely if not completely industrial. Still is to a large degree south of the Dunn Bridge. I don't think 787 should go away entirely. Nor should it be converted completely to a boulevard. Could it be simplified? Absolutely. How exactly does having vehicles idling at intersections instead of moving improve air quality? It's good to consider the possibility that conventional thinking is wrong, but in this case, the bigger picture needs to be looked at. Even if there is enough room on other streets to handle the volume, all these vehicles are going to have to exit 787 or 90 to get there. Wouldn't this backup traffic on both highways? If the solution to that is removing all expressways from inside the City limits, then perhaps it will work. However, I just don't see what the benefit is here. The premise that there are hordes of people trying to get to the Hudson River but can't figure out how right now just seems silly. Has any study been done that showed that if people could cross a multi-lane boulevard at a few more points, the riverfront would be "vibrant"? I'm also biased because I actually like the usual quietness of the Corning Preserve. I don't think it would be improved by having Alive@5-sized crowds there on a more regular basis. "-if that is the case-why are you weighing in on a highway issue that purely affects drivers?" Highways absolutely do not only affect drivers. The effect they have on residents of the city, from air quality to devalued land to cutting off neighborhoods from each other, is profound. "Also, what is your beef with drivers in the city of Albany?" I don't have enough time or room to fully answer, but generally homicidal behavior provides a good summary. In this case, my problem is the vast amount of land and infrastructure given to cars only to be barely used at all, at the expense of the city. "It's not like we're living in a pedestrian friendly city" Well, we could certainly do better, and the drivers may be worse than most places, but on balance, it's a very walkable city. Especially by American standards. "and the majority of the population commutes to the city" And? "so to advocate, again in your words, "taking all of the highways out of all the cities," is completely preposterous." I can't think of a single example of a highway being removed that did not result in a positive outcome. Even with all the problems of the Big Dig, Boston is infinitely better off than it was with a highway cutting its central business district into pieces. Same with the West Side Highway in New York. Going up to a city is fine, but at that point, streets that connect, not highways that destroy, are what is needed. 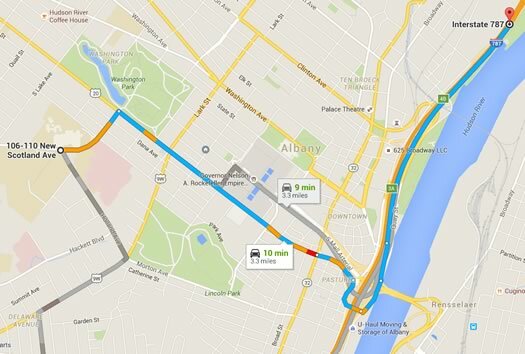 Just how do you propose I would get from Troy to Albany for work? Route 4? Route 32? Alternate Route 7? It will never happen. The capital program budget for Region 1 for this year is around $70 million. That is for every project in Region 1 from Greene County all the way to Essex County. This project alone would cost many times that. And pretty much all that money goes towards safety projects, like dangerous bridges and roads. This project would not even be for safety. So, it will never happen unless our infrastructure budget increases ten fold. This analysis hits the nail on the head! Most people would assume that an uninterrupted stretch of asphalt would mean quicker travel times, but for the small gains made from by-passing the traffic lights, you take a giant hit to your commuting clock jumping hurdles to get to the few and unequally distributed access points. Iâ€™ve long advocated that a boulevard would be a more sensible solution and a wonderful compromise to drivers and city residents (especially downtown). It would free up access to the waterfront for pedestrians and provide developable, taxable land to the city and enhance the commuting experience for drivers. The two come refrains I here are: 1) Show me how it will actually benefit â€œusâ€ drivers; 2) Show me the money. To the issue of benefits: as pointed out by Sandy, there is no concrete proof that it will, but given the limited sampling size of free-way tear downs, they have all benefited drivers and improved commute times. More importantly, multi-modal options see significant improvements and efficiencies out of these changes to the transit infrastructure; therefore, more people adopt mass-transit options or walk (more people on a bus, means less cars on the road for drivers to contend with). To the issue of money: while we do have to consider the costs associated with â€œretro-fittingâ€ 787, I think more importantly, we need to consider the short and long term maintenance costs for maintaining it. Per the last statewide transportation improvement plan (STIP) for the Capital Region (FY11-FY15), we sunk about $60 million on maintenance costs into 787. This only scratched the surface and didnâ€™t address the more costly bridges and ramps that would need maintenance in the coming decade or two. A boulevard would be significantly cheaper to maintain and arguably comes with a lot of win-wins all around. Cut and Cover a bypass road/rail from the Port to 90 and build an avenue above. If you remove 787 you still have to address the railroad tracks. Cut and Cover is the best bet creating your interstate (bypass) and access. You could even put some underground parking in where you have the room and tie in the bus station state owned land to keep the greyhound/Trailways buses off the streets and under ground in the tunnel. It would take $ but it would be worth it in the end. Imagine the tax revenue from all of the houses and commercial buildings that would be attracted to the waterfront. I suggest looking at the other side of the river, Troy and Rensselaer. No 787, nothing hinders water access. Lots of riverfront parks, smooth traffic flow... Or maybe not? And do we actually think Albany will be much different? It'd be nice to see NYS study this for a year, iron out safety concerns and then act. I think too often, NYS gets caught up in some extremely lengthy study and nothing happens. If it takes 10 years to reach some sort of conclusion as to what the next step of 787 will be - by the time they actually act, the benefits would be lost. You CANNOT have a bridge cross a river on a diagonal! That's the stupidest thing I've ever heard. First off it would look ridiculous, second it probably wouldn't be structurally unsound, third, it would probably end up crashing boats and planes and stuff. Thanks Sandy for some fresh ideas and citations for those who want to learn more. I wish people could be more open-minded and say, hey I've never looked at it that way (like the empty streets at rush hour) and think maybe there are parts of this that could provide solutions. I also agree with the comment that the state & city can't afford to 10+ yrs to just think about this. As for ample capacity.. 787 carries 85000 vehicles daily in the most busy part. To put things in perspective - Central ave has 42k near Colonie center and 36k near westgate. So we're talking about 2-3 streets of uptown Central ave scale to take all that traffic, or 5 downtown Central/Madison ave size ones. Broadway? Maybe, with elimination of street parking and cross-if-you-dare crosswalks. 787-boulevard, sure. North Pearl? Looks narrowish. Here's a radical idea. Why don't we use the space to build a light railway? It could connect with BusPlus pretty easily. It would connect North Albany to downtown. A road could be built next to it. While redeveloping the post-787 Albany waterfront, it would be good to re-route the freight train tracks that bring all those dangerous tanker cars so close to the waterfront and the city itself. They really, truly, absolutely do not belong in such a heavily populated area. The industrial needs that must be met by rail can be met on less prime real estate. Thanks for pointing out the s swan backups. But it's worth noting, if you're trying to get on the highway there, it's two lanes. The vehicles coming around the hairpin turn are in one lane and swan goes into the other. Unless you're driving a fire truck or there's a bus coming around the bend, you have enough space to go, even if another car is there. Nothing makes me more annoyed on my commute than sitting in a long line waiting for a hesitant driver to finally decide to turn into the S. Swan circle. All I am trying to do is get on the highway and go to work! I have never seen a city traffic set up like that. That said, PSA: please, tell your friends family and neighbors, it is two lanes. Just turn right! I know it's scary but boldly go into the traffic circle. In other 787 news - as a daily 787 commuter I'd be FINE if it became a boulevard and I got on somewhere in Menands or the Delaware neighborhood. It might add 5 minutes to my commute, but it would give my kid access to the corning preserve and a waterfront to enjoy one day. "Here's a radical idea. Why don't we use the space to build a light railway?" Oh I don't know, maybe wasting untold hundreds of millions to billions of dollars on top of the already prohibitive cost of removing the highway might just not be the best priority for a small city? I wish people would focus on something smaller than tearing down all of 797. Start with the South Mall expressway, that god awful intersection with its ribbons of ramps and the current bridge over the river. Get rid of that and replace it with ground level roads, and a river level new bridge or two. It would transform both Albany and Rensselaer, open up both riverfronts, and knit back the north and south sides of Albany. Envision that! Take a walk an imaging all those ramps gone. Mike, since there's basically no traffic crossing the river between the two cities, it probably wouldn't have a huge effect. I'd be plenty happy keeping the bridge at its current height, though, if the South Mall Arterial and the enormous interchange downtown is removed. Why are we talking about the railroad bridge? This is the Dunn Memorial we're talking about here. I didn't suggest lowering the bridge - I just commented on its low volume and utter uselessness and the fact that hardly anyone would be inconvenienced by that situation. But this interstate and the overpasses will need to be rebuilt, and most likely in our lifetime.That would be a great time to deal with the grossly overbuilt bridge and south mall. JayK - railroad bridge is quite close to Dunn memorial (and Patroon island for that matter), so I assume river traffic - both count and height - are almost the same for all of them. So I would think any new bridge in downtown need to have at least same 60' clearance. And for the third time, I'm not arguing it shouldn't be that high. But I've never seen significant traffic on the Dunn Memorial, during any hours, rush or otherwise. (Though it probably got up there when the Patroon Island bridge was reduced a few years back.) It makes sense that this one would have less traffic, since the Patroon Island bridge both carries a major interstate highway and connects to the Greenbush'es. JayK - ah, I thought we were talking river boat traffic.. Thanks for clarifying. Oh, whoops! This whole conversation make so much more sense now! Thanks as always for providing the traffic counts, and I couldn't agree more than we do not need another twin bridges scenario. Here we go, another $23 million dollars being sunk into the maintenance of this poorly planned monstrosity. The work being done to the South Mall Expressway, which sees about 21,000 vehicle rides daily, means that each of those vehicles is costing the state taxpayer $1,061. This doesnâ€™t even take into consideration the $58 million sunk into work to 787 itself over the past 5 years. All totaled, this brings us to a current investment of $81 million dollars since work began in 2011 to maintain this infrastructure. And we still have a lot of work ahead of us to preserve 787 in its current state. Sadly, before a concrete decision gets made on how best to tie this artery into the urban fabric of downtown (aka enhancing walkability and access to the waterfront) we may have sunk to much to turn back. My math was looking at how much this project would cost the individual drivers who actually use the infrastructure. $23 million divided by 21,000 vehicle rides daily = each unique rider would have to shell out $1,061 to cover the cost of the work to be performed. Using your ten year example, each driver would have to pay $106 per year, or a toll of 45 cents a day (since these are primarily state workers, this equates to about 240 driving days that they would be tolled) to finance the project. At the end of the day, Iâ€™m not necessarily saying that those who use it should pay for it, but I think thought experiments like this help to capture what the true costs of a project are and explore who should bear the burden. Jurisdictions who tend to toll the direct users of infrastructure investments typically donâ€™t see their projects move beyond the drawing board when the actual users bear the weight or seek more holistic solutions to spread the burden. You can see this bearing out with the â€œNewâ€ New York Bridge (aka Tappan Zee Replacement). Instead of raising tolls now to help pay for the bridge and to increase them to match the total investment moving forward, the rest of New York State will end up subsidizing this bridge on behalf of the direct users. Iâ€™m pretty sure that if direct users of the Tappan Zee were told that they would have to pay $25 tolls (the latest estimate to pay back the bridge via tolls), they would have been more forceful about ensuring the bridge incorporated better mass transit options (currently doesnâ€™t) in order to share the burden or allow them to utilize alternative commuting options thatâ€™s would be more affordable. Personally, I go back and forth on the issue. Some days, I think direct users should have to shoulder the burden of an investment, because it will help them better understand how much they cost to the greater system and may think twice about their own commuting habits. On other days, I think that if we arenâ€™t looking to export the burden to others who donâ€™t use the infrastructure, weâ€™d weâ€™d probably never see things get done. Comments from people who obviously don't have to drive into Albany every day. Tear down 787 and 87 becomes a parking lot. Cohoes is already in the process of bottlenecking the end of 787. What, do you expect the 40k+ people who commute daily to move into Rensselear? Expand a few lanes of 87, make it like I95 in NJ if we eliminate 787. Its good we are dealing with this now though. 787 is a requirement of the capital district. Gridlock would be automatic. It would cause numerous deaths, injuries, loss of revenue and a disgust for the capital district. The american Indians planed 7 generations into the future. Just maybe we should have too. Any changes additions or rebuilding would create such a multidimensional impact, that it would sink our ship. Stupid. You want to stop gridlock.... PUBLIC TRANSPORTATION SYSTEM. THINK OUT OF THE BOX. JACK. OUT OF THE BOX. GIVE INCENTIVES, TO THOSE TO USE IT AND THOSE TO DEVELOP IT.